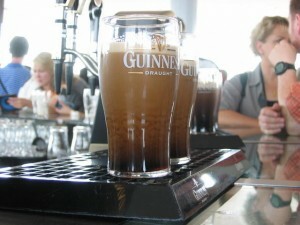 Interest in changing Ireland’s archaic licensing laws usually only reaches a critical mass at closing time. By morning, many of the previous night’s most ardent lobbyists have crossed into the temperance camp, swearing allegiance to Father Mathew on the big white telephone. Recent times have seen a dramatic shift in drinking customs with ‘staying in’ becoming the new ‘going out’. Publicans, as you might expect, are not at all pleased with this change. Not purely because of their loss of revenue, they claim, but because they worry that members of the public would not know when to stop drinking. How would we know it’s ‘time’ without lights flashing, bouncers shouting and pushing, and a perilous walk through a city-turned-war zone. To add insult to injury for the publicans, supermarkets are now selling alcohol at reasonable prices. According to Gerry Mellett, the President of the Vintners Federation of Ireland, (VFI), the ‘only way’ Ireland’s pub trade can survive is if a minimum price is set for alcohol sales in supermarkets and off-licences. It should be noted by the VFI that price, while a significant factor, is not the sole reason that people choose to stay home to enjoy a tipple. There are other factors dissuading the general public from the thrills and spills of a night out in modern Ireland. Firstly, there is getting into a bar, no mean feat in itself. At the door of the establishment there are burly apostles of temperance forbidding entry to those who may have partaken of the forbidden fruit that is off-licence booze. If deemed sober enough to enter, you can join the scrum for the bar, pushing and elbowing all the while waving a crisp €50 note. Eyes must be set to a wide angle ready to pounce on any flicker of recognition from a server. Finally you get your drink, you crumple your change into your pocket and attempt to move away from the bar, inadvertently spilling much of your coveted prize onto yourself. You stand with friends but it’s too loud to talk so you down your drink and prepare once more to enter the fray. Come last call, you have two choices: stay put and enjoy your last drink or join the greatest scrum of the night. Then it’s all over, ‘get out!’, you’re off into the night precariously avoiding fists and food being thrown with abandon. So why is it like this? The VFI have designed it so. A short window of opportunity for drinking ensures efficiency and better profit margins. Imagine the possibility of being able to go out to a bar on a Saturday night, acquiring a seat at a table with friends and getting table service. Drinkers and non-drinkers all socialising in a civilised manner, grown adults being allowed to make up their own minds when it’s time to go. You may call me a dreamer but I believe adopting such a system would encourage people out to the pub even with cheap supermarket beer available. Why? Because the alcohol would be secondary to the experience. Perhaps it would even be possible to order some food with a round of drinks, or have I gone too far? This could be a reality in Ireland, alcohol and food available twenty four hours a day, no mayhem at 2.30am on Grand Parade, no pavements covered in blood and vomit in the morning. Why, instead of demanding government intervention to keep a flawed and undesired system in place, will the VFI not allow the whole trade to be restructured? An abundance of bars to cater for all tastes. Instead of paying Rupert Murdock thousands for the right to show Sky sports, bars could invest in local musicians, providing a platform for artists and an option for an evening out without focusing on getting blathered. Any government intervention should allow for smaller bars to compete in turn enabling better service provision for the community. Through tax dispensations for small owner occupier bars, livelihoods could be created and communities’ social needs could be catered for. Allowing bars to open for any eight hour period within the day would ensure that the public could decide when and where to drink. Such bars would have to compete for customers and with a little imagination, factors other than the availability of booze may encourage the public in. The system could be turned around so that bars compete for customers rather than punters competing for service. Small bars may not make millionaires of the owners but they would provide a decent livelihood. If lower alcohol prices in the supermarkets end the era of the ‘super pub’, it should be seen as a victory for the public. Sure there will be job losses, mainly minimum wage jobs that have little prospects or longevity anyway. The recession in Ireland has seen all businesses restructuring as competition increases. The pub trade is no different, and government intervention to enforce a minimum price on alcohol will only prevent competition not benefitting society in any way. Let the public decide how they choose to drink: who knows, maybe we will decide that slower paced drinking leads to a more sustainable and enjoyable relationship with alcohol in the long term.